Location: The Institute of Aviation (Instytut Lotnictwa), al. Krakowska 110/114 (Włochy), free entrance, 5 pm – 11 pm. The event is dedicated to enthusiasts of aviation, aircraft, space, science, and technology. Aircrafts, helicopters, unmanned aerial vehicles. A chance to meet civil and military pilots, parachutists, engineers, astronomers, cosmonauts, scientists. More in English. Facebook event in Polish. Location: Ptak Warsaw Expo in Nadarzyn, Al. Katowicka 62 Street, 05-830 Wolica 114D. Over 20,000 dogs from over 60 countries, 340 breeds. More in English. Facebook event in Polish. The event takes place on October 11-14. Location: Kinoteka movie theater (located in the Palace of Culture and Science) and Multikino Złote Tarasy movie theater (located in Złote Tarasy shopping center). The biggest international film festival in Poland. All films will be screened with Polish and English subtitles. More info in English, including the detailed agenda. Facebook event in English and Polish. The event takes place on October 12-21. Location: Museum of Asia and the Pacific, Solec 24A Street (Powiśle), free entrance, 10 am – 6 pm. More in English about the Exhibition. Check out our tips in English on visiting the Museum. The exhibition runs until November 10, 2018. Location: Music Hub Academy, Al. 3 Maja 5b Street (Powiśle), Melofun (dedicated to children aged 3-4, 55 PLN per class), 1 pm – 1.45 pm;Intro Band (dedicated to children aged 5-6, 65 PLN per class), 12 pm – 12.55 pm; Band (dedicated to children aged 7-11, 95 PLN per class), 2 pm – 3.30 pm. Send an email in English or Polish to sign up: kontakt@musichub.pl. Click here to learn more about Music Hub music classes for children in Powiśle and Wilanów. Location: Tarabuk bookstore, Palace of Culture and Science (entrance from Świętokrzyska Street, the same as the entrance to Lalka Puppet Theater), 12.30 pm – 1.30 pm, free entrance, registration required (tarabuk@tarabuk.pl). Facebook event in English and Polish. Location: the Old Armory (Stara Prochownia) building at Boleść 2 Street (the Old Town), 10 am, 12 pm, 4 pm. Performance ‘Jongle’ (theater from France) dedicated to children aged 2,5-6. More in English. Location: the Palace of Culture and Science, Sala Marmurowa / Marmurowa Room (the main entrance to the Palace from Marszałkowska Street), free entrance, 1 pm – 8 pm. Attractions include Indian dance show, yoga show, Henna (Mehndi), Indian food. Facebook event in Polish. Location: ‘Folwark Bródno’, Św. Wincentego 92 Street (Bródno), 10 am – 6 pm, free entrance. Attractions for children include arts and crafts workshops, games, exhibition and sales of pumpkins, Zumba, pony riding. Facebook event in Polish. Location: Wilanów Garden, Stanisława Kostki Potockiego 10/16 Street. Opening hours October 13 – October 31, 2018: 5 pm – 9 pm. It can be crowded during weekends, buy tickets online to skip the line. Mappings (illumination, picture, and sound) on the Palace façade at 6.30 pm, 7.30 pm, and 8.30 pm. 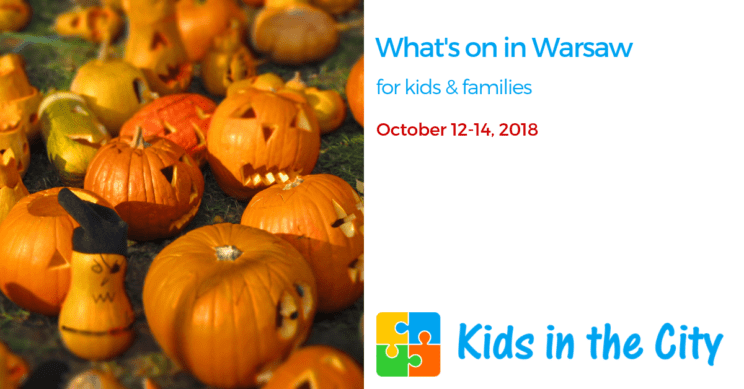 Click here to read Kids in the City tips in English on visiting the Wilanów Palace Museum and Park, including information about “The Royal Garden of Lights” – ticket info, opening hours. Location: the area next to Royal Wilanów (in case of bad weather, the event will take place in the concert hall at the Wilanów District Office), 11 am – 1 pm, free entrance. Attractions include a theater for children ‘Pippi Goes on Board’, workshops for children, circus show, pumpkin carving demonstration, and pumpkin soup for everyone. If you don’t have any homemade preserves, you can bring for exchange a new book, a pillow or a board game which later will be donated to the Oncology Department of the Children’s Hospital. Facebook event in Polish. Location: The Praga Musem of Warsaw (Muzeum Pragi), Targowa 50/52 Street, 10 am – 4.30 pm, free entrance. The event is a part of a conference ‘World in Focus – Warsaw International Gathering’ (more in English). Location: Teatr Niewielki, SOHO Factory, Mińska 25 Street, building no. 74 (Praga). ‘Puf!’ a performance dedicated to kids aged 1-6: 10.30 am, 12 pm, 3.30 pm. Click here to read more in Polish and buy tickets online (39 PLN). Location: Łazienki Royal Garden, 11 am – 12 pm. The yoga class takes place outdoors in the Park (check out the exact location on the map). In case of a very bad weather, the class is canceled. Facebook event in Polish. Location: Tor Wyścigów Konnych Służewiec, Puławska 266 Street. Website in English. Facebook event in Polish. In Polish schools, there are no regular classes on this day. Usually, there is the inauguration event for first-year students (ślubowanie) and older kids either do not go to school or have some fun activities. Students give teachers flowers and/or gifts. This year, since October 14 falls on Sunday, schools will celebrate either on Friday, October 12 or on Monday, October 15. Location: Mokotów Sports Center, Niegocińska 2A Street, free entrance, 11 am – 5 pm. Attractions include 30 multidimensional models of ships and characters from Star Wars movie, fantasy miniatures games, miniatures and models workshop. Facebook event in Polish. Location: Cultural Center in Powsin (Dom Pracy Twórczej), Ptysiowa 3 Street, free entrance, 8 am – 2 pm. Attractions include a theater for children about pumpkins (11.30 am, Facebook event in Polish), pumpkin dishes tasting. In return for 3 kg of electro-waste, you will receive a pumpkin as a gift. Facebook event in Polish. Location: Służew Cultural Center (Służewski Dom Kultury), Bacha 15 Street (Mokotów), online tickets (10 PLN), 4 pm. More in Polish. Location: Teatr Baza, Podchorążych 39 Street (Mokotów), 10 am (online tickets 26 PLN), 11.30 am (online tickets 26 PLN). During the workshop, children sing songs in different languages, eg. English, Spanish, Russian, Ukrainian. Facebook event in Polish. Location: Bemowo Cultural Center (Bemowskie Centrum Kultury), Górczewska 201 Street, 11.30 am – 1 pm, free entrance. Facebook event in Polish. Location: Teatr Niewielki, SOHO Factory, Mińska 25 Street, building no. 74 (Praga). ‘Raz, dwa, trzy’ – a performance for children aged 2-5: 10.30 am, 12 pm, 3.30 pm. Click here to read more in Polish and buy tickets online (39 PLN).